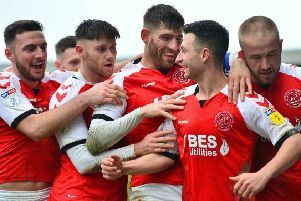 Joey Barton says his Fleetwood Town players deserve their weekend break but he insists the slippers will be thrown off next week with a play-off spot still to fight for. Barton has given his players the weekend off after the postponement of tomorrow’s home clash with Sunderland. The game has been rearranged for April 30 due to the Black Cats’ international call-ups. 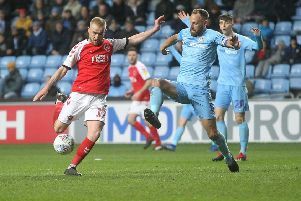 It means Fleetwood have a two-week gap between fixtures and Barton says some rest is much-needed as 10th-placed Town bid to bridge the five-point gap to the League One play-off zone with eight matches left. But while Grant McCann’s Doncaster, who occupy the last play-off place, hit the spa and Nigel Clough’s Burton Albion went warm- weather training in Spain, family man Barton wants his players to spend some time recovering at home. But when they return next week Barton wants his players raring to go for the trip to Accrington Stanley a week tomorrow. The Town boss said: “It gives us a chance to get a bit of rest, recovery and recuperation into the lads. “You have to protect against the lads thinking, ‘Oh, that is our season over’. But we are saying, ‘Nope, far from that!’ We will give them a couple of blasts and they are well aware of what is expected of them. “But we will build in some rest and recuperation time because they work incredibly hard. We have been in every game. The second half at Walsall was the only time this season I have been disappointed. Barton also paid tribute to the Highbury faithful for their efforts in braving the conditions for last weekend’s 2-0 home win over Plymouth Argyle. He added: “The fans are important. Sometimes they have to realise just how important they are. “On days like Saturday it would be easy to stay on your couch. I am not entirely sure I would have ventured out. “I’d have put Soccer Saturday on or one of the results programmes and watched the results come in. Young Town goalkeeper Billy Crellin has returned from England Under-19 duty early after breaking a finger in a warm-up session.